Stamping Rules! 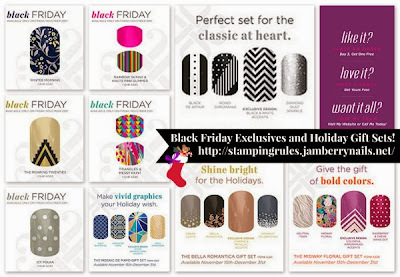 : Black Friday Jamberry and Giveaway! Black Friday Jamberry and Giveaway! I'm not normally a Black Friday Shopper. The last time I went out Black Friday shopping I went to Target for a gift for my then 2 year old son. I hung out in the far back of the parking lot until the mad rush of people had entered the store, then I ran straight back to...toys, where no one was shopping for half off toy trains oddly enough. I grabbed my Thomas the Tank Engine treasure and made a beeline straight to the checkout. I was in and out in ten minutes. The time before that I was very pregnant with the same child, and obsessed with adding rhinestones to the announcement holiday cards I was crafting so I stood in line at Joanns F-O-R-E-V-E-R...to buy five packets of bitty glue on rhinestones (this was pre-self adhesive sparkle days). Pregnancy induced insanity. Still shaking my head. Normally on Black Friday I hole up in my stamp room with a bunch of Stampin' Friends and we crop the day away. This year I'll be missing my girlies while making some fun family memories instead - but I am planning to sneak a teensy bit of time to head over to Jamberry and stock up on some of these exclusive Black Friday only designs. Those Navy Blue Winter Morning florals are practically screaming my name! Best of all they count towards the buy 3 get one free special, which makes Jams a totally affordable holiday splurge. Oh my Icy Polkas! While I'm there I might just have to sneak a peek at the Holiday gift sets, with four coordinating shields...I pulled this from Instagram...all my fav bold and graphic black and whites plus GLITTER in the Monochromania set? Or that sheet of pretty soft sparkly metallics in the Bella Romantica set? I don't know how I'll choose. I do love that I can decide from the comfort of my home! To share the Jamberry love, anyone ordering in the month of November will be automatically entered into a drawing for a free sheet of Jams...yes, even you lovely ladies who already ordered this month. Good luck, brave shoppers. I'll have another slice of pie for you!